I made what is most likely my final visit to Two Rows brewpub yesterday after work. I went to enjoy a few final pints and pick up my mug that's been hanging above the bar for a dozen or so years. It was actually very quiet when I arrived with only a few people scattered around the bar and restaurant areas, but both bartenders indicated the place has been packed every night since the announcement was made that they'll be closing on Oct 2nd. Everyone has been coming in for a final beer, including a couple who drove in from Austin just to pick up their mugs. There's still plenty of beer flowing though, including the new Oktoberfest that was just released. A chalkboard near the bar indicates an "Art of Darkness" series of beers that Ray Mittledorf, Brewmaster at the Houston location, was apparently working on which was to include an espresso stout and a porter. Unfortunately, those beers won't be brewed. Ray wasn't around when I was there, but I was told he is looking around Houston for locations to potentially open a new brewpub. I definitely wish him lots of luck and hope that he's able to do it. While I sat and sipped on some of the last freshly made beers in Houston, the bartender indicated that they had also just received 140 new growlers on Friday, the first new batch that includes Ray's name on them as the brewmaster. I couldn't resist picking up another great souvenir to go with my mug and asked for one filled with the Oktoberfest. By the time I left a few hours later, the place was filling up and two very large groups had filled the bar area. I'm sure it will be a complete madhouse this evening during the final $1 beer night. If you get a chance, I recommend stopping by for a pint. The growlers could even be a collectors item one day. Yes, The Covey closed tonight. Bittersweet. The most beautiful thing of it all: my true friends remain. WTF? I just watched them win yet another medal at the GABF last week. According to their updated website, Jamie Fulton, the owner and Brewmaster of The Covey, is moving on to a new project called Farmers & Brewers in Washington D.C. Its great that he's got something else to go on to, but it means Texas has lost a second brewpub in only a week. Another Great American Beer Festival has come and gone. Over 455 breweries served more then 2,200 different beers in the festival hall to over 49,000 attendees. 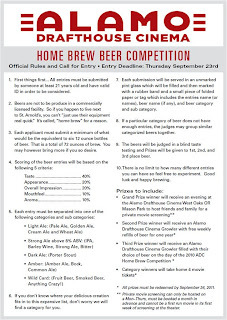 Just over 3,500 beers were entered into the judging competition which is up from the 3,300 last year. I did prepare a little for the convention in that I created a list of the breweries that I definitely wanted to try beers from, but I really didn't take the time to write them all down as I sampled. I started to, but that got tedious and cut into my sampling time. I'll just say that there were a lot of great beers, but also quite a few that were not. There were definitely some very unique beers that I was very impressed with that I'll mention though. The Oatmeal Raisin Cookie Brown Ale from Cigar City Brewing (all the beers they were pouring were excellent) was just like drinking a cookie. The Hoppin' Jalapeno Cream Ale from Wasatch Brewery was smooth and creamy with the full flavours of a jalapeno but with only a little of the bite. Rocky Mountain Brewery had beers that can only be described as dessert in a glass. Taking a sip of their Tatonka Blueberry Cobbler, Eat a Peach or Da Yoopers (cherry) and you got a mouthful of fruit and crust flavours as if you just bit into a pie. 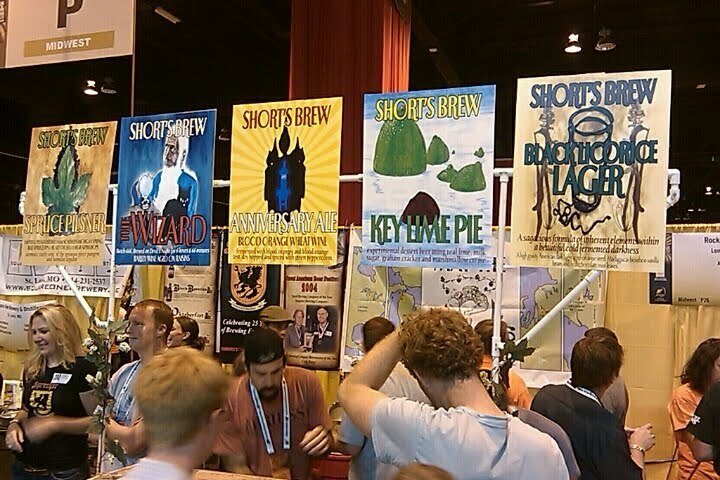 The Key Lime Pie from Shorts Brewing was another highly talked about beer. All their beers were very popular and they ran out of beer early every night of the session. Of the four sessions at the GABF, the Thursday night and Saturday afternoon sessions are my favourite. Since Thursday is the first session, everyone is full of energy and excited to be there. Most of the brewery reps are behind their booths and all the different beers are still available. Saturday is great because you get to watch the awards being announced and if you're quick, try some of the beers that won that you haven't already tried (before they run out). Friday is still fun, but a lot of the brewery folks are often off at other events and parties, leaving only the volunteers to answer any questions about the brewery and the beer. The Saturday night session can often just be a mad house (although I didn't see any fights this year). Almost all of the beers that won an award are long gone and quite often so are all the beers at the popular breweries. The brewery reps that are actually there are tired and ready to go home. But its still hard to pass up being there for all four sessions just to be able to soak it all in and enjoy the atmosphere. One of the hidden gems on the festival floor is the booths for the various brewers guilds. They were moved from the side wall to the center of the festival this year, but most people still seemed to ignore them. What's so special about them? The booths pour beer from the breweries that are members of that guild and in some cases, beers that are not even available at the brewery's booth. Stone's Vertical Epic 070707 was one of the beers pouring the first night along with beers from Lost Abbey/Port Brewing, AleSmith and Jolly Pumpkin to name but a few. If you missed the guild booths this year, I highly recommend you check them out next time. 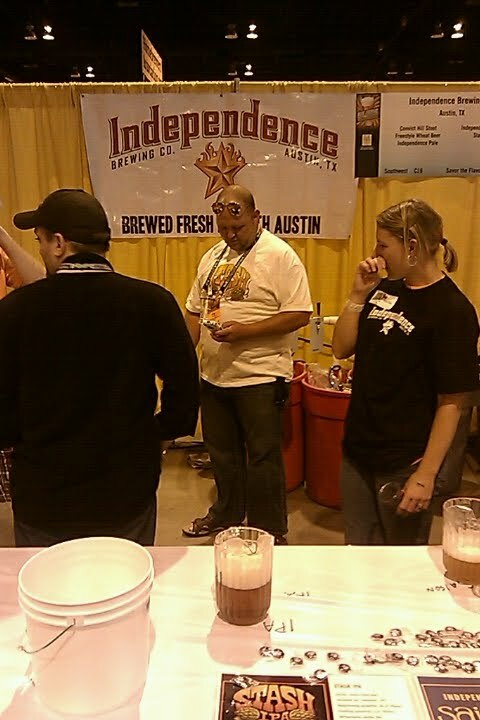 I spent some time behind the Independence Brewing booth again this year helping to pour beer and answer questions. It was great to see how many people made the trip up from Texas for the festival and there many former Austinites stop by to say hi when they saw where the brewery was from. The Saison was a huge hit and the second keg of it had to be brought out during the first session. It actually had to be rationed during Friday's session to ensure there would at least be some to pour on Saturday afternoon. The Stash IPA was another crowd pleaser and T-shirts for it were for sale at the GABF merchandise booth and it was cool to actually see people wearing them around the festival and out on the streets. There may not have been any medals for Independence this year, but the beer was a bit hit with festival goers. Overall, it was another great festival experience. 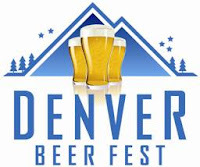 The 2011 Great American Beer Festival will be held Sept 29th ~ Oct 1st. Circle the dates on your calendar and start making your plans now. 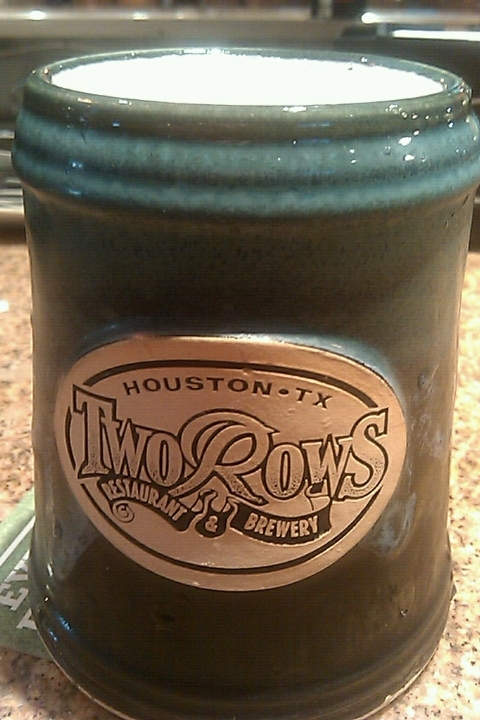 When I moved to Houston in the mid 90's, there was at least half a dozen operating brewpubs in the area (click here for info and history of Houston's brewpubs). However, by the early 2000's, they were all closed except for Two Rows which has continued to brew beer in their Rice Village location for almost 14 years. Unfortunately, as reported today by Ronnie Crocker at Beer, TX, they've lost their lease and will be closing on Oct 2nd. I was a frequent customer of Two Rows during the first half of its life and even still have one of the mugs you see hanging above the bar. However, the quality and consistency of the beer started to slide and it finally came to the point that I just stopped going entirely. But things started to change when Ray Mittledorf was hired as the brewer back in March of this year. I got a chance to hang out with Ray one afternoon this summer and drink a few of the beers that he had brewed since he took over. The beers were definitely a huge improvement and I was looking forward to the seasonals he wanted to brew. Unfortunately, it appears that they've lost their lease after negotiations with their landlord, Weingarten Realty, failed. They may look at moving to a new location, but in two weeks, the fourth largest city in the U.S. will be without an operating brewpub. Texas medal winners from the 2009 Great American Beer Fest is available here. On a plane and on the way to the 2010 Great American Beer Festival. The Houston Press posted a review of the Beer 101 class that was recently hosted over at the Anvil by co-owner Kevin Floyd. Towards the end of the article, it indicates that Kevin will be leading another beer lecture featuring India Pale Ales. The IPA lecture will take place on October 9th from 1pm ~ 3pm and the price is $50 per person. Drop by the Anvil in person to make a reservation and while you're there, enjoy some of the great beer they have on tap or one of their handmade cocktails. This was the fourth Camp Beer event but the first one that concentrated on a single style of beer. Given the name Stoutapalooza, this installment of the event concentrated on stouts and included vertical tastings of the very rare Darklord from Three Floyds Brewing and The Abyss from Deschutes Brewery, as well as other well known and highly rated beers. Most beer geeks are very familiar with Darklord and the Darklord Day hosted at the brewery in honour of its release. Its a difficult beer to get a hold of or even have the chance to try, but Camp Beer had not one but three years worth, allowing for a vertical tasting of the 2010, 2009 and 2008 releases. This beer is typically aged for years to allow the flavours to soften and mellow, so it was no surprise that the 2010 had strong flavours of coffee, dark fruits and soy sauce with a burning affect from the high alcohol. These flavours and qualities will usually soften as it ages, but it was great to compare a fresh one with the release that were one and two years old. The the flavours in the 2009 were significantly mellower with a stronger chocolate and raisin flavours and creamy mouthfeel. Oddly enough, the 2008 was actually more like the 2010, with a bitter coffee and almost slightly acidic finish. The 2009 was the general favourite amongst the crowd. The vertical of the Darklord was followed by a vertical of the 2009, 2008 and 2007 releases of The Abyss from Deschutes Brewery. The 2009 had flavours of strong bitter coffee and hazelnut with some bourbon in the nose. The flavours were similar in the 2008, but it had a much more dry and bitter finish and little residual sweetness. The 2007 seemed to be favoured by most with smooth coffee flavours and a slightly dry finish. The vertical tastings were over, but they were followed by two stouts from the same brewery. Breakfast Stout and Kentucky Breakfast Stout are both brewed by Founders Brewing Co. The Breakfast Stout was good with flavours of coffee and roasted malts, but the Kentucky Breakfast Stout was overpowered by the strong bourbon flavour. It would probably do much better after some further aging, but too strong and harsh right now. As far as bourbon stouts go, the Bourbon County Stout from Goose Island is probably one of the best there is. Flavours and aromas of bourbon, oak and vanilla, but with nothing that is too strong or overpowering. This is the way I prefer my bourbon stouts to taste. The Barrel-aged Boris the Crusher from the Hoppin' Frog Brewery was not a beer that I was familiar with at all. It was actually a lot lighter in comparison to the other stouts we had already tried. Well balanced flavours of coffee, oatmeal and dark fruits with the alcohol level well hidden. The afternoon was finished off with the Divine Reserve #5 from Saint Arnold Brewing which was donated by me to Camp Beer for the event. I had a large quantity of it aging in my beer cellar and decided to donate it to Cathy's worthy cause and share it with other beer geeks who would appreciate it. It had certainly aged well in the three years since its release. Bitter chocolate and roasted malts, the high ABV is still noticeable but very subtle. Once again, Cathy from Live It Big organized a fantastic Camp Beer and Kevin from the Anvil did a great job of leading the group through a discussion about the beers (even as the crowd got rowdier from the effects of the high alcohol beers). The next Camp Beer will be on December 12 and focus on Holiday related beers. An early list of the beers that will be featured includes Great Lakes Holy Moses, 07 Jubilation, 08 Souther Tier Choklat, Lost Abbey 10 Commandments & Inferno, Hoppin' Frog Frosty Frog, Nogne O Winter, Port Brewing Santa's Little Helper and Mikkeller Santa's Little Helper. Circle the date on your calendar now and follow CampBeer on Twitter for information when the tickets go on sale. Tickets are extremely limited and can be purchased in advance for $30. It looks like Friday is going to be a long day. 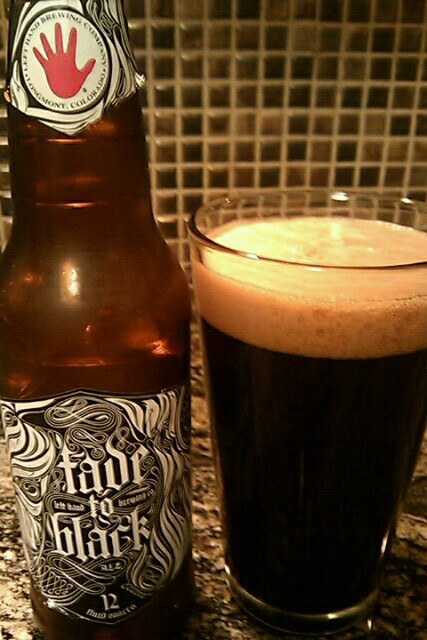 In anticipation of the Virtual Beer Tasting, I dug around in my beer cellar and pulled out a bottle of Fade to Black by Left Hand Brewing and Chocolate Oak-Aged Yeti from Great Divide. I started with the Fade to Black. Poured a total black colour with a frothy head that dissipated but continues to leave lacing down the glass. Deep coffee aromas. Flavours are dominated by coffee and chocolate with a very smooth and rich mouthfeel. This beer is going down way to easy and quick. I may have to put another one of these in the fridge or dig around in the cellar to drink after the next beer. The first beer seemed to disappear way to fast. 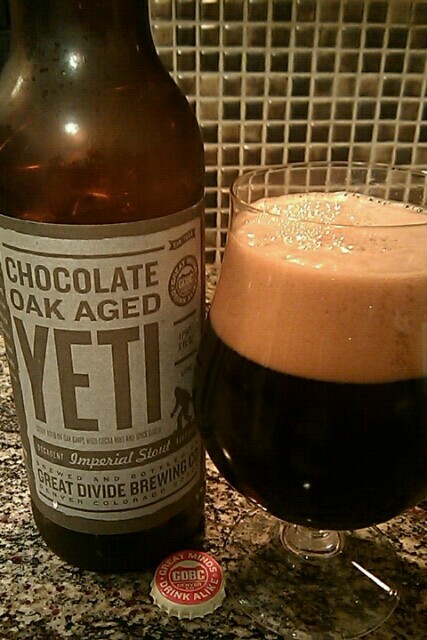 The Chocolate Oak-Aged Yeti from Great Divide is 22oz bomber, so it should last longer. Thick, creamy head. Aromas of oak and chocolate and the higher ABV is noticeable as well. Sharp, bitter chocolate flavour to start with a pepper spiciness to the finish. Mouthfeel is very smooth, but there's a bit of a light burn from the alcohol late in the finish. On Thursday, September 9th the first ever Virtual Beer Tasting will be held by the organizers of the upcoming Beer Bloggers Conference. 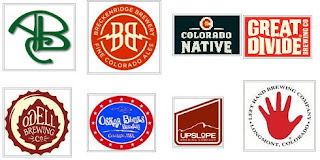 To participate, pick up a couple of beers from a Colorado brewery (preferably one of the breweries indicate to the left) and at the crack of 8:30pm CST, open the first beer and commence sampling. Then, post about the beer using Twitter (with the hash tag #bbc10 and the one for the brewery), Facebook, your Blog or leave a comment on the Virtual Beer Tasting website. The Ginger Man is hosting a Oktoberfet party on Saturday, October 2nd from noon to 2:00am. A DJ will be providing music from 1pm ~ 5pm with live music from 8:oopm to midnight. Traditional German beer and food will be available. No cover charge. Wearing your best Lederhosen is always encouraged. The map of the 2010 Great American Beer Festival (GABF) convention floor is now available on the website. The brewery tasting booths are arranged by region of the country and the attending breweries from Texas are in the Southwest section. If you have any specific breweries and beers that are a "must try", I strongly suggest you print the map and mark the location of those booths. It can be overwhelming and chaotic in the convention center (particularly if this is your first time) and you will definitely miss out on some great beers if you just wander up and down the rows (save that for after you've got to the ones you wanted). 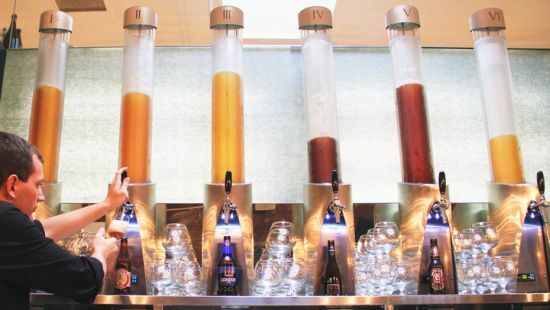 In short, the BeerVaults has the ability to make ANY beer available "on tap" by extracting the beer out from the bottles and pressurizing it into an in-built reservoir. The in-built cooling and carbonation technology maintains the temperature and freshness of the beer itself. The clear tubes that contain the beer are UV-filtering clear acrylic canisters surrounded by a clear volume of liquid glycol to keep the beer cold. Its a pretty cool sounding system if it actually works well at preserving the beer. There are often times that I see a beer available at a bar that I would love to have, but don't want to (or can't) drink entire 750ml bottle of it myself. 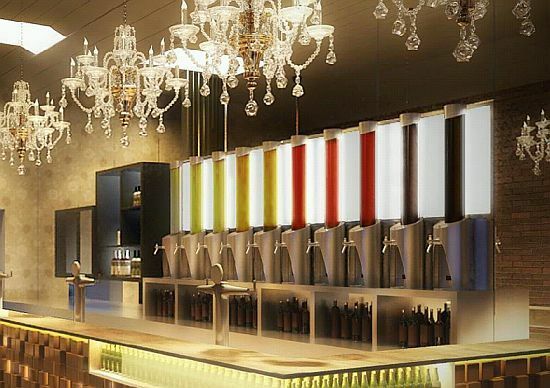 This would also allow the bar to provide a sample of such a beer before someone orders a large (and often pricey) bottle of it or to be able to sell it by the glass without the worry of wasting unfinished bottles. I could certainly see this starting to pop up in high-end beer bars around the country. Its currently in use at a bar called Biero in Melbourne, Austrailia (photo to the right). It would look pretty cool on the back bar at a place like the Anvil. On Monday, September 20th, the Ginger Man will host a beer tasting by Belukus Imports that will feature beers from breweries such as Belhaven, Mannekin-Brussels, Barbar, Malheur and others. The cost is $11.25 and the tasting starts at 8pm. Saint Arnold Brewing is hosting an Oktoberfest celebration at the brewery on Friday, October 1st and Saturday, October 2nd from 6pm ~ 9pm. The cost is $40 per person which includes dinner, pretzel and commemorative mug. And of course the Saint Arnold Octoberfest beer will be flowing. There is also a contest for the King and Queen of the Oktoberfest, so dust off your best Lederhosen. To reserve tickets for Friday, October 1st, click here and reserve for Saturday, October 2nd, click here. 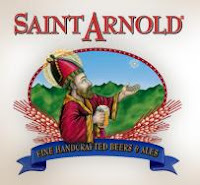 The Ginger Man will have Saint Arnold's Weekwacker on draft today (Sept 2nd). For those that have not had a chance to try it (and those who have but want more of it), it will be available from opening until its gone. A cask conditioned version of the Weedwacker will be available on Tuesday, Sept 7th from opening until its gone, giving you one last chance to try it as well. The name comes from one of Houston oldest and most historic breweries. 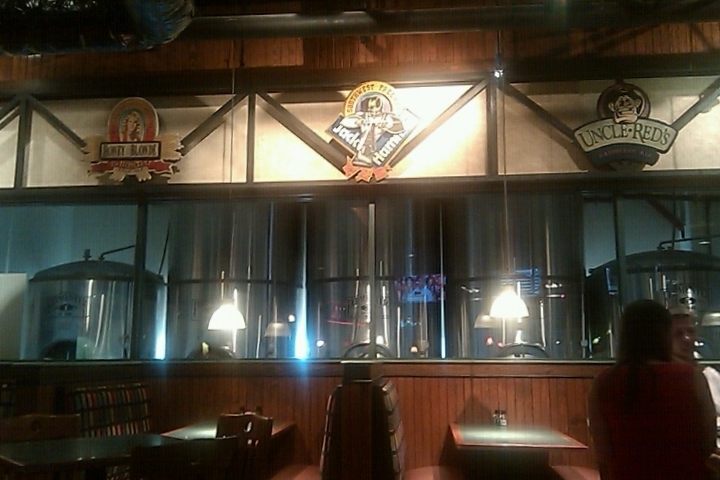 Gulf Brewing Company was originally Howard Hughes brewery. We are reviving it with our own taste. It also indicates their state application has been filed and they're looking for a brewhouse. Houston has suddenly jumped from having a single craft brewery for many years to potentially having five or six if the ones that have announced their intentions actually all open. Independence Brewing of Austin, TX is celebrating six years of brewing quality handcrafted beers in South Austin with an anniversary party at the brewery on Saturday, October 23 from 4:00pm ~ 7:30pm. Admission is free, but commemorative anniversary glasses will be available for purchase. A special anniversary beer has also been brewed up for the event. Come out and enjoy live music, games and great beer and help celebrate 6 years of Independence!